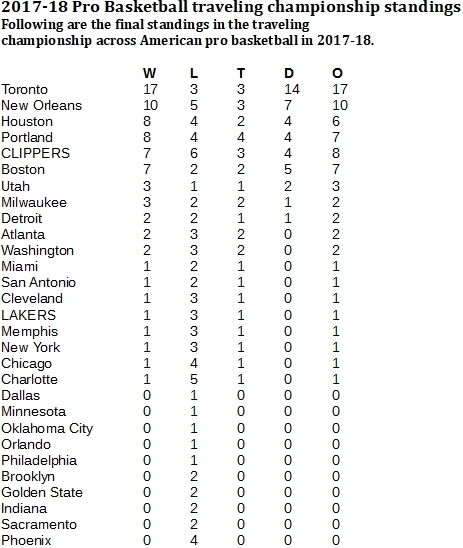 LA Big Leagues: Raptors rip through hoop traveler, but Warriors still lead all-time. 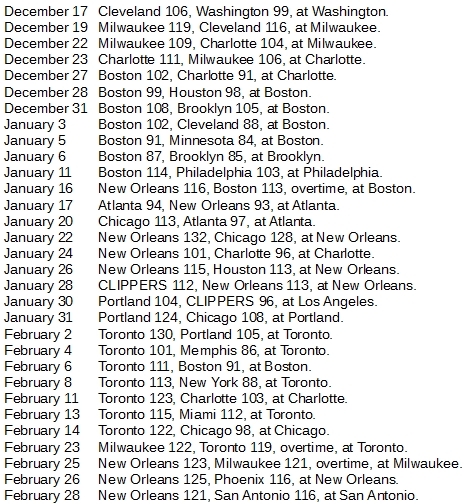 Raptors rip through hoop traveler, but Warriors still lead all-time. The Toronto Raptors controlled the pro basketball traveling championship far more than any other team in 2017-18, but the Golden State Warriors still have controlled the title for the most games all-time. Once upon a time, 2015ish, it was decided that these pages would, from time to time, chronicle a traveling professional basketball championship across the best league in the world. Nothing unusual there – we do that in a lot of sports. It made sense, starting the title with the 2015-16 season, to give the first defense to the Golden State Warriors, who had just won the NBA championship. It made additional sense when the Warriors assembled an incredible defense, a 24-game winning streak right out of the gate. And that, alone, even if the Warriors hadn't won another traveling championship game through the 2017-18 season, would still be enough to give them the all-time lead. As it happened, the Warriors enjoyed another 16-game championship streak later in the 2015-16 season and ended that year with a 40-2 record. That second streak ended on March 6, 2016, when the Lakers beat them, 112-95, at Staples Center. From that day through the end of the 2017-18 season, The Warriors didn't win another game for the continental traveling championship. But they're still 40-5 historically, easily the best record across pro basketball. Golden State's silence in the last two seasons says something else about this competition. Contrary to the all-time standings, there is no clearly dominant team here on a year-over-year basis. 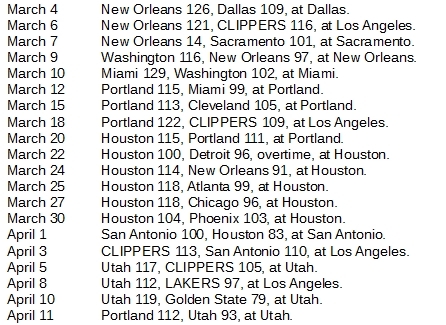 Only two teams, the Clippers and the Miami Heat, have put together two seasons in which they could win more than a half-dozen games. The Heat won seven games during the first season, then came back and won Team of the Year with 15 victories in 2016-17. But this year, they won only one game. That still gives them the second-most wins all-time with 23. 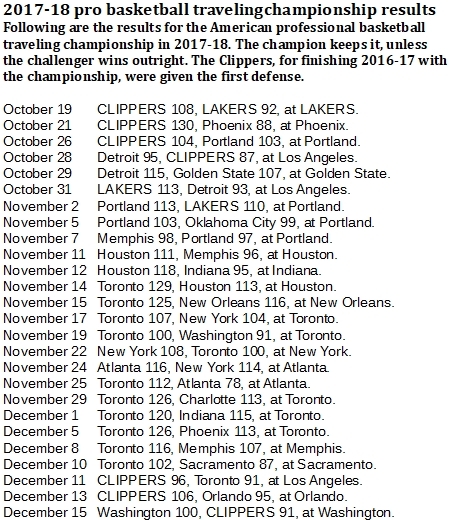 The Clippers lost all five of their bids for the title in 2015-16, but came back in 2016-17 with nine wins and in 2017-18 with seven wins, for 16 overall. That puts them in fourth place all time, behind the 2017-18 Team of the Year, the Toronto Raptors. All 17 wins the Raptors have ever counted for the title came in 2017-18, as the Raptors lost their four bids for the title during its first two seasons. They figured it out in 2017-18, winning three titles, including a seven-game sprint right up to the All-Star break. The Raptors never again played for the title after that, but no one was catching them.